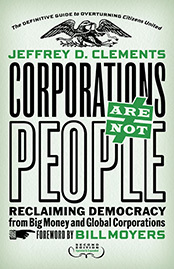 The Supreme Court’s Citizens United ruling that corporations are people eliminated campaign finance restrictions and dramatically increased corporate power –but attorney Jeff Clements shows how you can fight back. Clements explains the strange history of how the Supreme Court came to embrace a concept that flies in the face of not only all common sense but most of American legal history as well. He shows how unfettered corporate rights will impact public health, energy policy, the environment, and the justice system. In this new edition Clements details Citizens United’s ongoing destructive effects—for example, Chevron was able to spend $1.2 million to influence a single local election in a city of 100,000 people. But he also describes the growing movement to reverse the ruling—since the first edition 16 states, 160 members of Congress, and 500 cities and towns have called for a Constitutional amendment to overturn Citizens United. And in a new chapter, Do Something!, Clements shows how—state by state and community by community—Americans are using new strategies and tools to renew democracy and curb unbalanced corporate power.